The file manager looks and feels like Windows File Explorer and follows user interface guidelines. Let your users easily manage their files with the comfortable and intuitive approach already known from the daily desktop working environment and minimize user learning curve. Actions are both represented on the ribbon (top) toolbar and in the context menus and they are automatically disabled/hidden when not available e.g. when corresponding permissions are not granted. This way users will only see the actions that are available to them and they will not be confused. Navigation (folders) pane allows fast hierarchy browsing and breadcrumb navigation bar allows users to keep track of their location and to drill down folders easily. 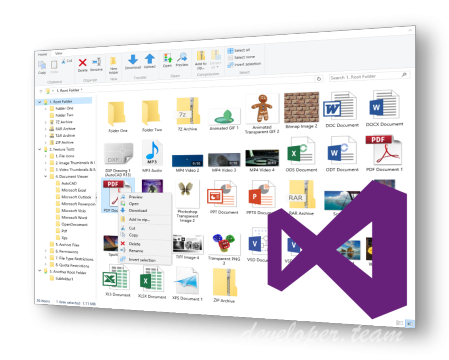 Folder contents are displayed via a multi-view which supports 6 different view layouts: Extra large icons, Large icons, Medium icons, Small icons, Details and Tiles. Thumbnails for all common image and video files are displayed. For all other file types, high-res icons are displayed. Integrate a file manager into your ASP.NET application or site rapidly. Browse and manage files with access control. Accept files with the advanced upload functionality. Offer a structured and neat download area. Preview documents (70+ file formats, including PDF & Microsoft Office), images, audios and videos. Your users don’t need to have an application (eg. Microsoft Office) on their computer to be able to view these documents. The Document Viewer supports High Resolution. Text, fonts and vector elements are preserved and rendered in high-res with no rasterization. Zoom in as much as you want, your documents will look great and same as they do in the program that created them. Media Player will first try Html5 video feature of the browser and if not supported it will try Flash mode. If a media format is not playable at all on the browser, media player will prompt the user to try opening the file directly on his computer/device so you automatically have a streaming media server. Image Viewer supports zooming, panning, rotating and flipping. Transparent images will be displayed with a nice background pattern to differentiate them from images with solid color backgrounds. This is similar to “Compressed Folders” in Windows Explorer but for all archive formats not just for zip format. In addition, it supports displaying thumbnails while in archive and supports browsing nested archive files so it’s more advanced than Windows Explorer’s feature. The zip files can be modified but other formats are read-only. For example, you can directly upload into zip files and download files directly from all archive files. Upload multiple files at once. Upload files by dragging and dropping them from your computer. Upload files of unlimited size (e.g. a 10 GB huge file). Download multiple files or even whole folders at once. When downloading a single file, pausing/resuming in the browser is possible so interrupted downloads can be completed. Download files of unlimited size (e.g. a 10 GB huge file). Limit actions, disk usage and file types on folder basis. File manager will automatically show or hide actions according to the viewed folder’s access control. Prevent navigating up to parent folders with “Root Folder” concept. Define root folders which point to existing paths on the server or on the network. Set display names for root folders and hide the actual path information for security. Renders fast and keeps the load on the page at minimum by minifying, combining and compressing jаvascript and CSS files and by not using ViewState. Minimizes memory usage and has robust code, free from memory leaks. Keeps a responsive UI while processing large amounts of data.